Spend less time planning the logistics of your trip. Get the best value for your money by using Webjet to find the perfect Bangkok holiday package from Australia. Score the cheapest flights for your travel dates and stay at the best hotels in the city that suit your budget. Hassle-free Experience: Don't spend hours online trying to plan your itinerary. With a few clicks, Webjet will curate the best flights, hotels and activities for your trip. Save Time: Let our travel agents help you plan the perfect holiday. World-class Service on a Budget: Stay at some of the best hotels in Bangkok and fly with leading airlines - even if you're travelling on a budget. No hidden costs: Your final payment will be made before you leave for Bangkok, so you don't need to worry about spending more money once you arrive. Built in 1782, Bangkok's Grand Palace was the royal residence for generations. Today, it's still used for important ceremonies, and it's one of Thailand's top attractions. Inside the palace, you'll find decadent architecture and Wat Phra Kaew, a temple that houses the famous Emerald Buddha. With so many temples to visit in Bangkok, Wat Pho stands out. It's the oldest in the city and is known for its 15-metre Reclining Buddha. The soles of the statue are inlaid with precious stones, and it is so big that it cannot be viewed in its entirety, only in sections at a time. Chatuchak is one of the largest markets in the world. It boasts more than 15,000 stalls selling everything from jewellery to clothes and delicious street food. It's located near the MRT station, and the whole market is open every Saturday from 9:00 a.m. to 6:00 p.m.
Once the home of an American entrepreneur, Jim Thompson's house is now a relic of Bangkok's past. After disappearing in Malaysia, it's been turned into a museum that offers a fascinating look into his life, the history of the city and his business within the Thai silk industry. 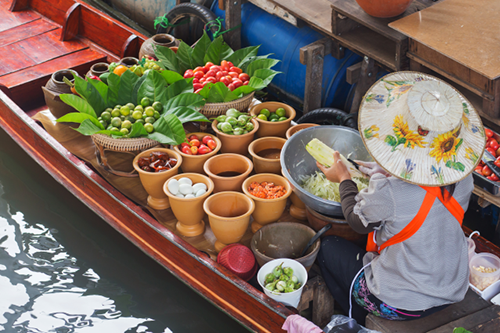 A trip to Bangkok wouldn't be complete without trying some of its cuisines. The city is known for its delicious street food that will hardly put a dent in your budget. Try everybody's favourite Phad Thai as well as other dishes such as Phad See-Ew, Khao Pad and Som Tum. Practice responsible animal tourism. If you want to see Thailand's famous elephants, tigers and monkeys make sure the animals aren't mistreated or neglected in any way. Do your research beforehand to find out if the activity you're supporting is ethical before parting ways with your money. Show respect to the King and the Royal Family. In Thailand, it is illegal to mock or harm them in any way. You'll also need to stand up any time the National Anthem is played in public places, at the movies or on TV broadcasts. Only drink bottled water. It's not safe, and you could end up spending your holiday sick or in the hospital. Stick to buying water from the shops and avoid eating fruits or vegetables that have been rinsed with tap water. Carry your hotel card with the street name and directions in Thai. If you're not using a ride-sharing service like Grab to get around town, this trick will help prevent any confusion with taxi drivers. Cover up your knees and elbows when visiting places of worship. It's considered disrespectful to Thai culture if you aren't dressed correctly and in some cases, you might be banned from entering.